Throw pillows are always a fun accessory to add color and texture to a room. However, they can get pretty expensive to buy. Even just buying material to make your own can add up. A solution to this is to recycle a sweater or other clothing for your material. This funky DIY sweater pillow combines a sweater with fabric scraps and other accessories for a unique look. Instead of buying fabric for the pillow itself, look around the house for fabrics you can recycle and use whatever you find that will be unique and fun. I love to recycle and for this pillow I used an old stretched out sweater of my husbands. Since I loved the color and texture, I was happy to be able to give it a new use. 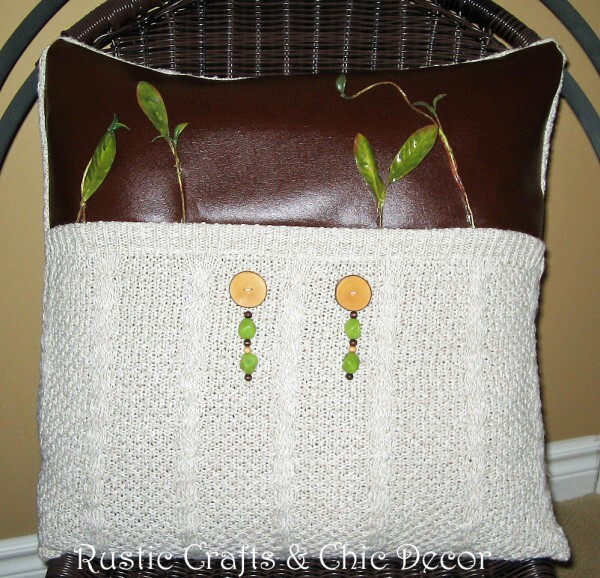 And, an upcycled sweater for a pillow is extra cozy and soft. I also had a small scrap of leather, left over from another project, that I used with it for a fun look. Plus, I wanted to incorporate some brown into my palette since it will be going onto a bed with a green and brown quilt. Old soft flannel shirts make great material for pillows as well and if you add a denim pocket from an old pair of jeans you have a fun throw pillow for a teens bedroom! I could have just left the pillow as is but sometimes I like to go a little crazy with embellishments, plus this was going to be in an area where it wouldn’t be leaned up on or cuddled against. So…I made some homemade buttons out of thin slices of branches for a rustic, natural look. Since I love beading, I also strung some beads in natural colors with beading elastic and twisted the strands around the two buttons. For further color and another natural element, I hot glued silk leaves to the leather. This also gave me plenty of green that I needed for the room. For this pillow, I sewed the leather strip and sweater front section together making it the size I wanted the pillow to be. I just did a top stitch at the seam because I had a nice edge at the bottom of the sweater. I then sewed the front and back together in a normal square pillow pattern. The back is just a solid sweater section. Whenever I make a pillow, I quite often simply cover old throw pillows that I already have. I was able to do that this time as well which saves money on the pillow form and gives me the ability to recycle an old pillow in need of an update. To see a pillow made entirely from an old sweater, check out my upcycled sweater post. Do you like to recycle? Would you consider making a pillow out of old clothing?